After Smart upgraded their 3 days 50 pesos internet surfing promo to 1GB, Globe Telecom also boosted their GoSurf50 data allocation to 1GB. This new GOSURF50 now gives you 700MB 1GB browsing for all sites and 300MB customizable free content bundles. This new bundle was started last July 2, 2016 and now available via USSD *143# menu using your Globe prepaid SIM card. On top of your GOSURF50 subscription, you can also get add-ons like GS Add Surf 15 for 100MB, 2GB Data with GoWATCH29, extend 24 hours validity with GS EXTEND and unlimited call and text to Globe/TM via UNLI10 for 10 pesos. To register, you can simply use the keyword below and text that on the given number or dial *143# then look for surfing promo option. With 300MB allocated for free contents that includes (Facebook, Viber, Snapchat, Spotify, YouTube, Clash Royale, Clash of Clans and Dailymotion), this will surely fit to users who usually spend more time on social media sites and mobile gamers. What makes it bigger is that it also gives you additional unlimited texts to all networks for 3 days. To check you GOSURF50 balance, you can text GOSURF STATUS to 8080. You will be notified your remaining MB’s while you are registered on the promo. 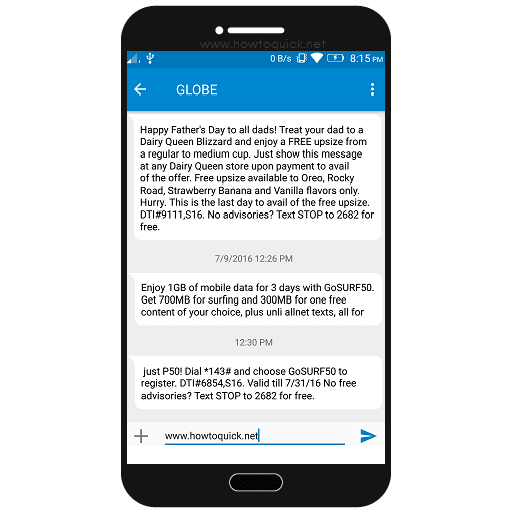 For more update and queries regarding this promo you can check or visit https://www.globe.com.ph/surf/plan/gosurf. i subscribed for GIGASURF 299 bkit wala pang 1 week na consumed ko na daw ung data allocation ko...which is viber lang gammit ko tas di naman tumatagal na open data ko..gamitin ko lang kapad online husband ko?? ?SMART ano na??? ?